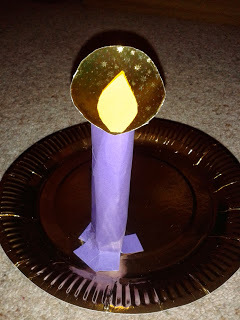 We’ve now entered Advent and I was thinking of how families could use the tradition of the Advent wreath at home in a craft and prayer activity. Of course it’s great to have the real candles to light, but here’s an alternative to make and do! 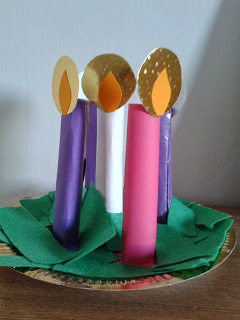 Each week’s Crossroads devotion during Advent will focus on a candle on the wreath. I also briefly explain each candle below to help you think about prayer ideas. To make a wreath, you will need: A paper plate, green felt or construction paper, tape, scissors, 5 rectangles of cardstock or construction paper (all one color or the more traditional 3 purple, 1 pink and 1 white), 5 gold paper circles, and 5 orange ‘flames’. 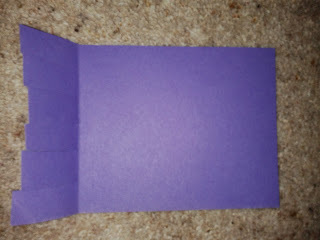 Take a rectangle piece of paper (purple, pink, or white) and make a fold at least an inch deep at one of the short ends. Cut slits into this bottom section so that the ‘candle’ will be easier to attach to the plate. Roll the paper into a tube and secure with tape. 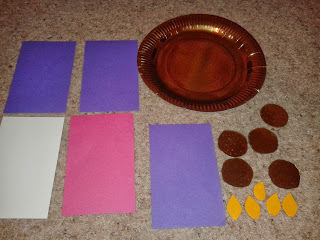 Make a flame using the gold and orange paper. Attach this to the top of the candle. Repeat these steps until you have 5 complete candles. Then, using the slits, tape the candles to the plate in a circle, with the white candle in the middle. Place strips of green felt or card over the plate to cover the candle bases and to create the greenery! If you are doing this as a family or along with the weekly Crossroads posts, you might want to only make one candle each week. This way you can draw or write prayers on the candle’s paper before you roll it and tape it to the plate. •	Christmas Day: Jesus, the light of the world (the white candle)—pray that God will help us to be like ‘light’ to others and that we will be able to help people find out who Jesus is.